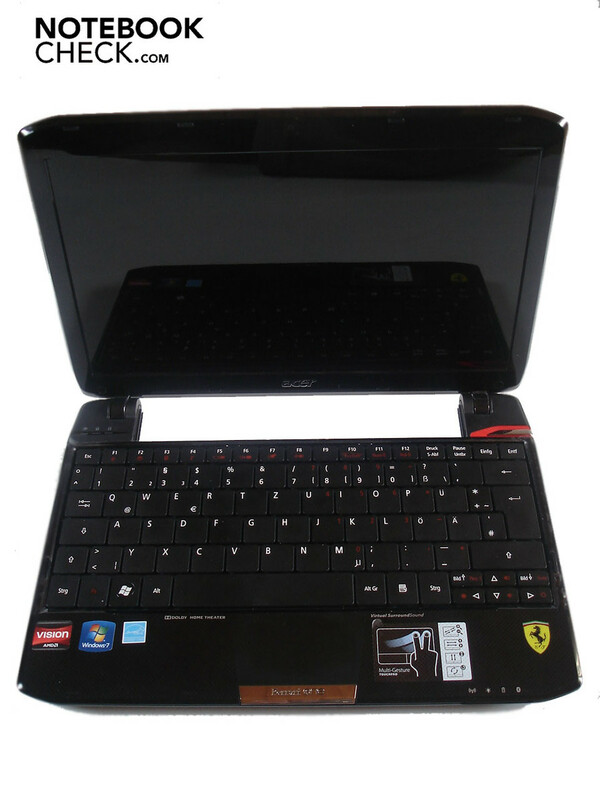 Contrary to the nearly identically designed Aspire 1810TZ, the Acer Ferrari One 200 is not equipped with Intel hardware, but uses mainly components from the competitor, AMD/ATI. 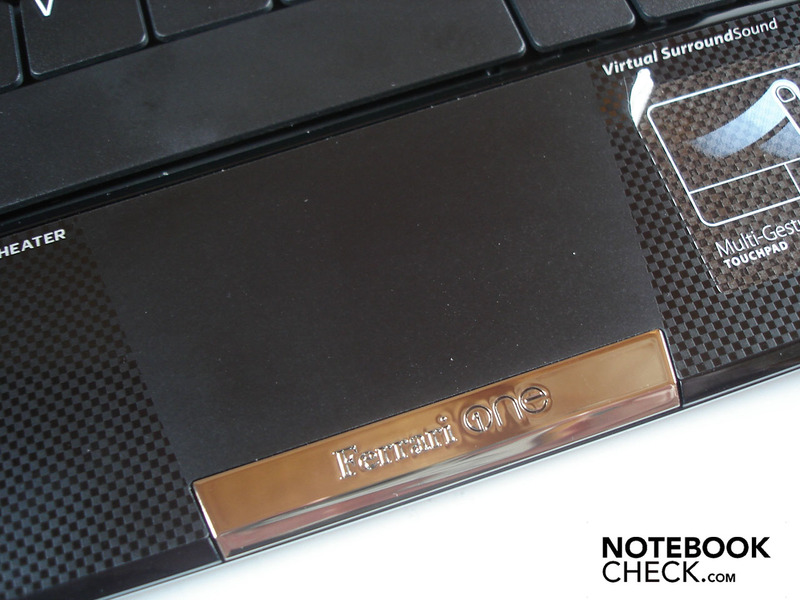 Continue reading our review to learn whether the flame red Ferrari One 200 is able to leave behind other subnotebooks in terms of performance and whether this is only possible at the expense of system noise, temperature, or battery life. At the moment there are two models of the Ferrari One 200 available. 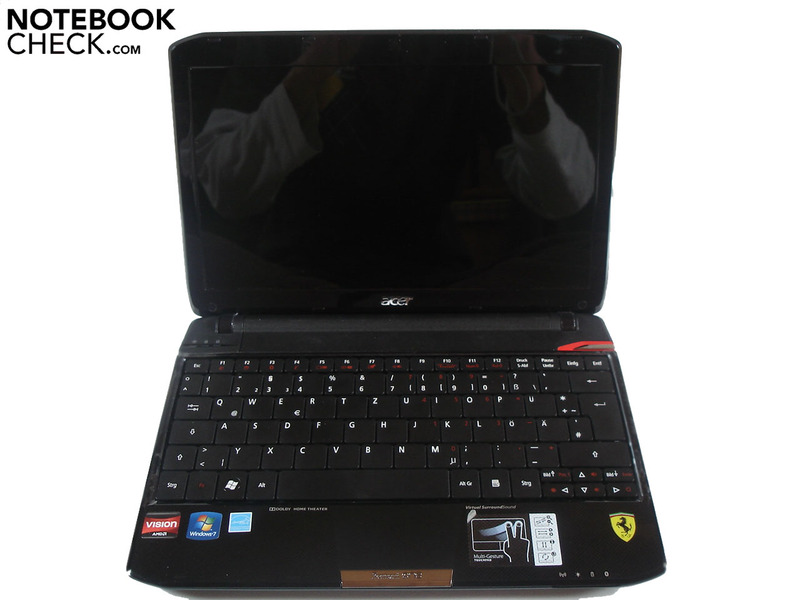 The entry-level model is the Ferrari One 200-312G25n at 480 euro, which is equipped with two GB DDR2 RAM and a 250 GB, 5400 rpm hard drive. 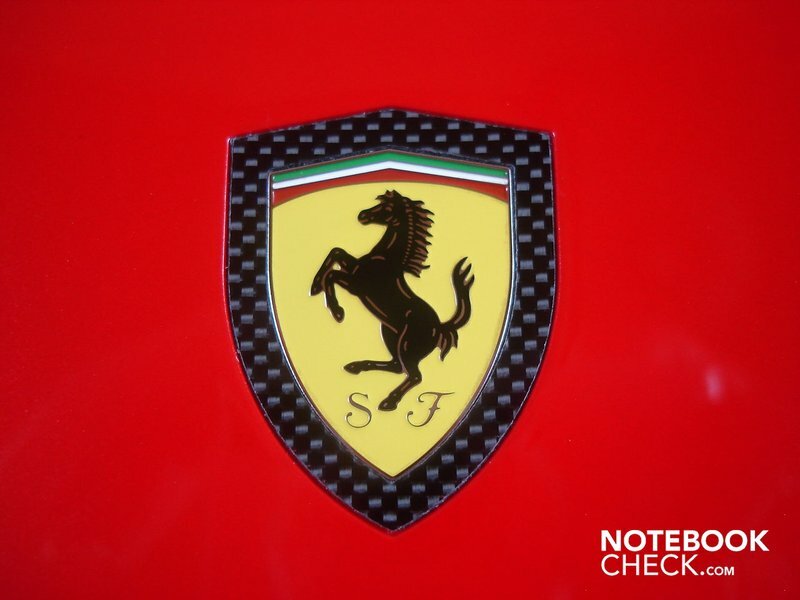 The Ferrari One 200-314G50n under review is sold for 580 euro. It comes with double the RAM capacity, that is 4 GB and also offers a bigger mass storage capacity of 500 GB. All other components of the two models are identical. AMD's Athlon 64 X2 L310 with 2x 1.20 GHz serves as processor. The integrated on-board graphic chip from ATI is called Radeon HD 3200. 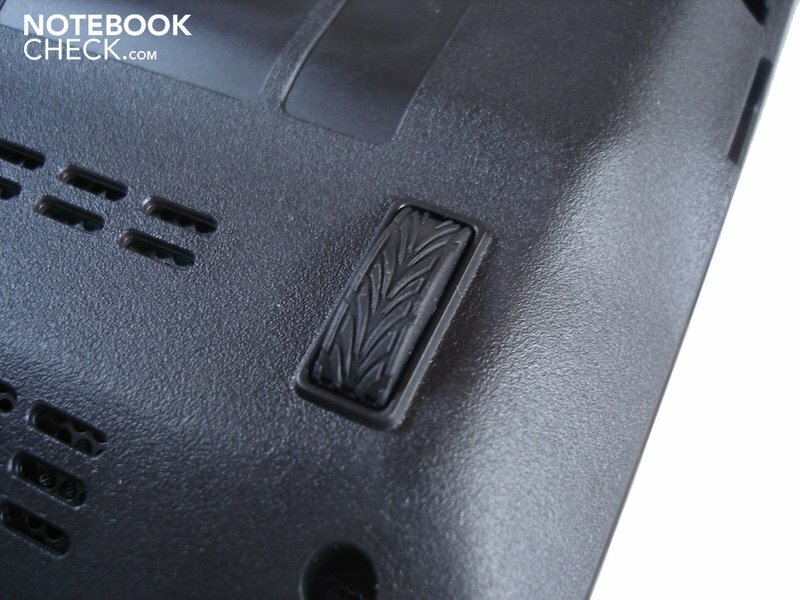 Thanks to the XGP-port on the rear side of the case, it is possible to enhance the graphic performance by more powerful external graphic cards. Both models have a small 11.6" display with a resolution of 1366x768 pixel and use Windows 7 Home Premium 64bit as operating system. 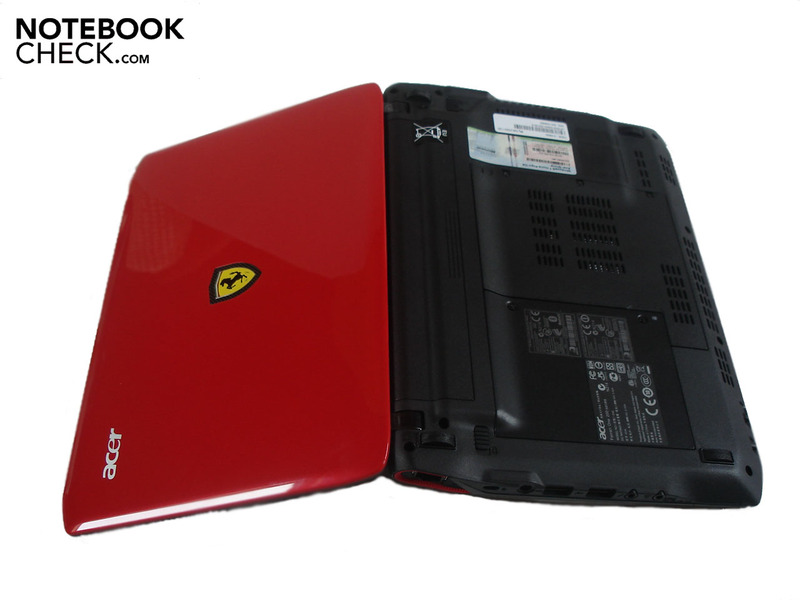 Acer committed themselves to the noble brand Ferrari in terms of design and emphasized the laptop's look. The glaring red display lid alone attracts attention. In addition the word-famous Ferrari emblem can be found in the middle of the lid and at the palm rest area. 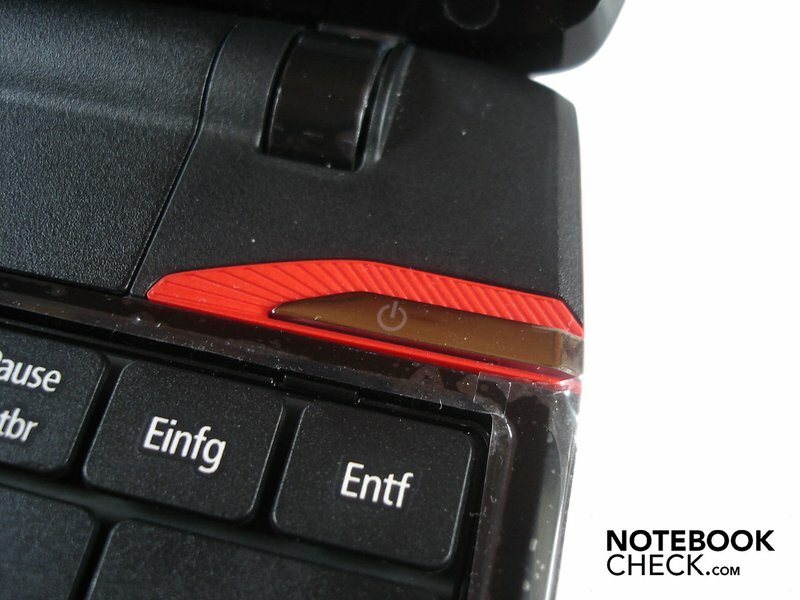 An elegant texture on the palm rests in carbon-look, silver touchpad buttons with Ferrari label, and the red bordered power button give the Acer Ferrari One 200 its own imprint. Furthermore, the tire pattern on the feet is a nice detail. 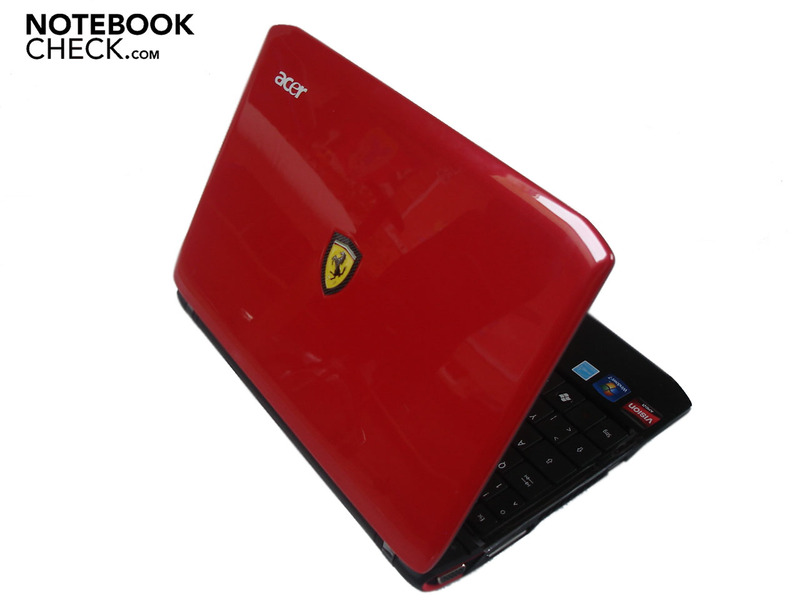 The result is an overall harmonious design, which should meet the taste of Ferrari fans. 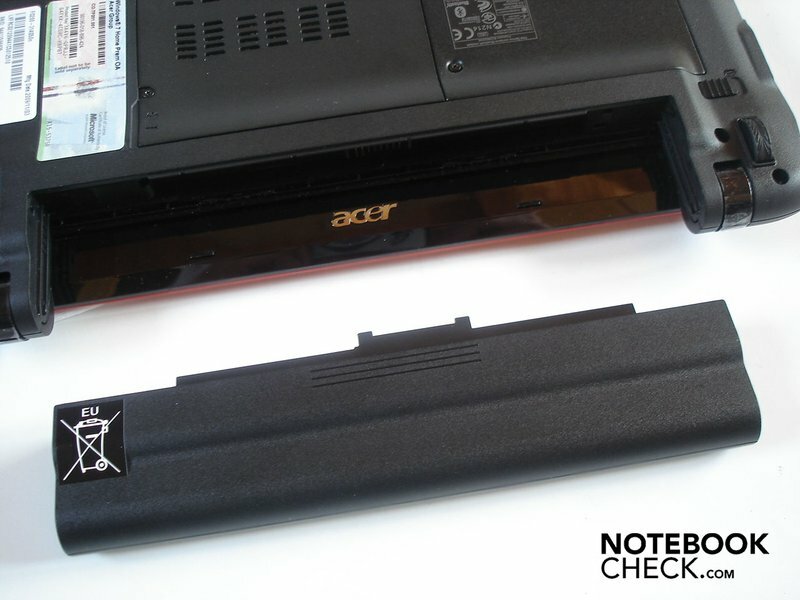 Regarding materials, Acer decided to use plastics, whereas the high-gloss lid and display frame dirty quickly. After a short usage period you'll already find lots of fingerprints there. Of course you cannot expect too much from such a light (about 1.48 kg) and small (285 mm x 204 mm x 30 mm) plastic case. While the underside is rather stable, the center area of the upper side gives clearly under strong pressure. In particular the lid is not very flexural rigid and can be clearly twisted causing image interferences too. On the other hand, the workmanship is nearly perfect and we could not detect any sharp edges or sloppily executed areas. The two hinges work reliably, but, audibly. However, they cause the case to luff at opening. Because there is not much room available, the connectivity is not really generous. The left side houses a VGA-out (in order to connect the Ferrari One 200 to external screens), a so-called XGP-port (which allows connecting external graphics cards in order to increase the performance) and one USB 2.0-port. On the right there are a 5-in-1-cardreader (XD, MMC, SD, MS, MS Pro), two audio interfaces (microphone, headphone/line-out incl. S/PDIF support), two further USB 2.0-ports, DC-in, a Kensington security slot and a RJ-45 LAN port. Front and rear to not offer any interfaces, but, the front side provides two sliders which allow controlling bluetooth (2.1) and WLAN (a/b/g/n) activity. However, the buyer has to waive HDMI or DVI-out (better picture quality on external high-resolution screens as with VGA) and a DVD-drive. 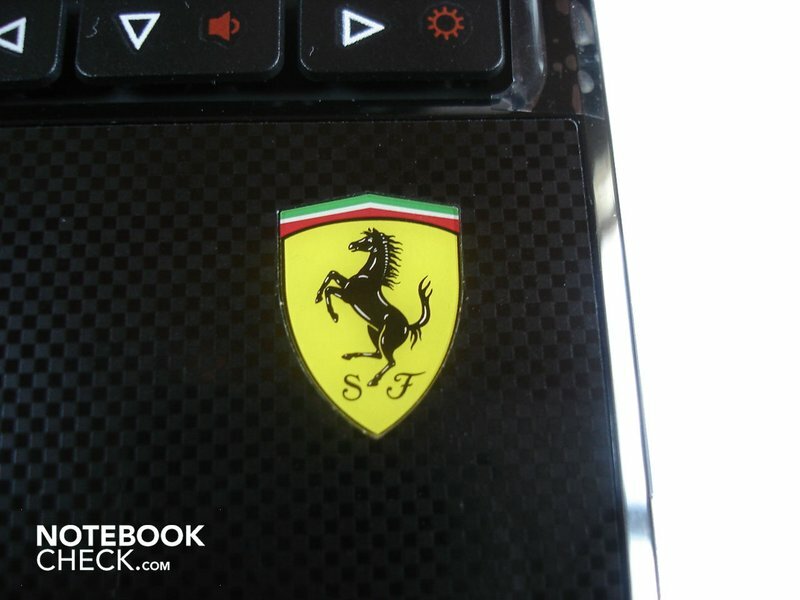 Apart from that the Ferrari One 200 offers a built-in microphone and a web cam with a meager resolution of 0.3 MP. 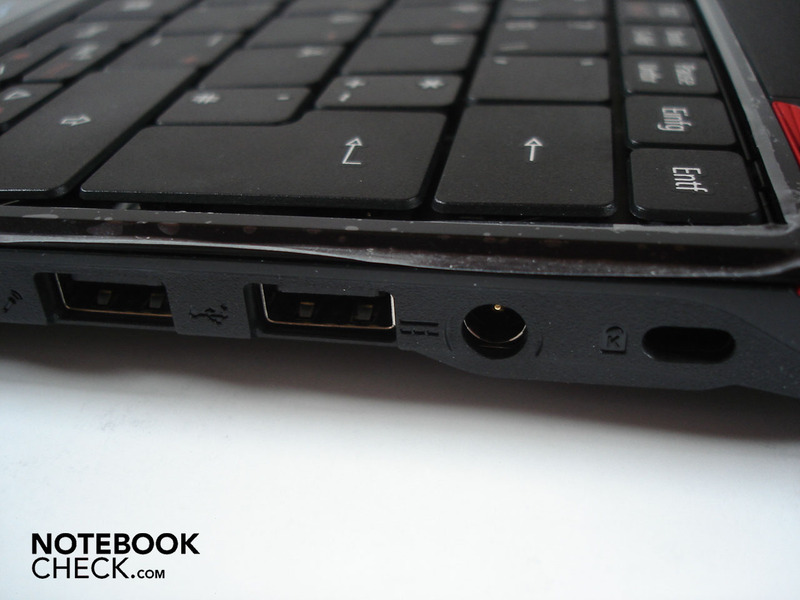 The port arrangement is alright, whereas the room for moving the mouse might be limited at the right of the laptop if many cables are attached to the right side. 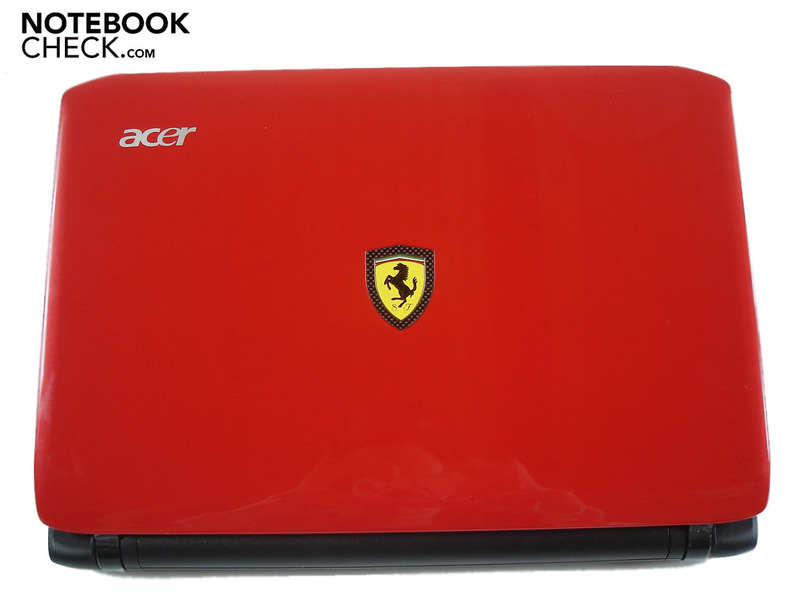 Acer has fed the Ferrari One 200 (once again) with a lot of Bloatware, i.e. superfluous software. Thanks to the dual-core CPU the impact on performance is not that bad as on netbooks/subnotebooks with single-core CPU (e.g., Intel's Atom N270/280). Nevertheless, it is noticeable. E.g., the boot process takes longer, and the respond time increases. If most of the unneeded software is removed, the system performs comfortably fast. 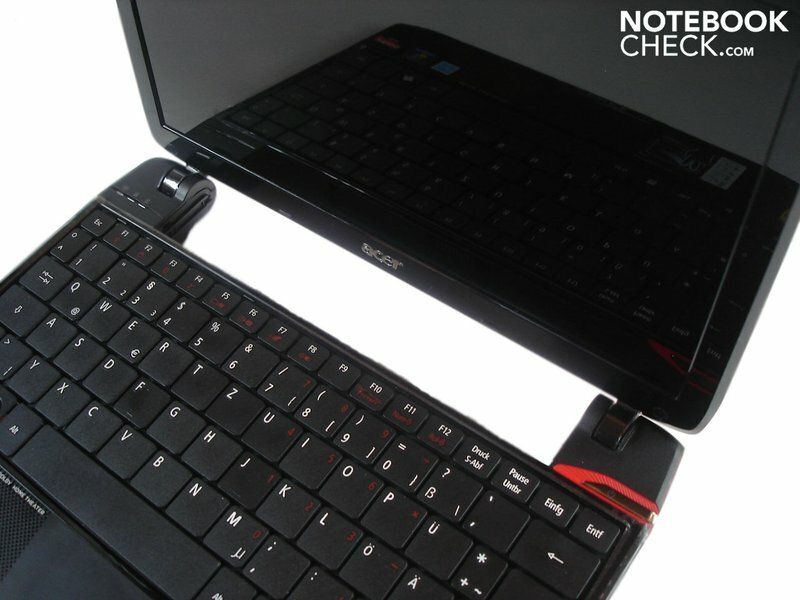 The keyboard slightly gives in its center, but the good and clear feedback qualifies the effects. The user must waive a separate numpad. 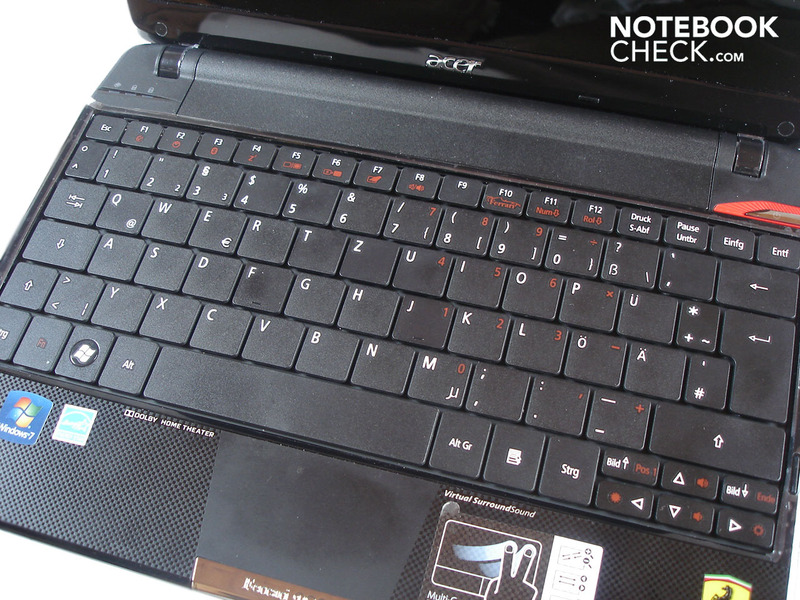 In return Acer integrated such in the normal keyboard, which can be activated by Fn+Num. 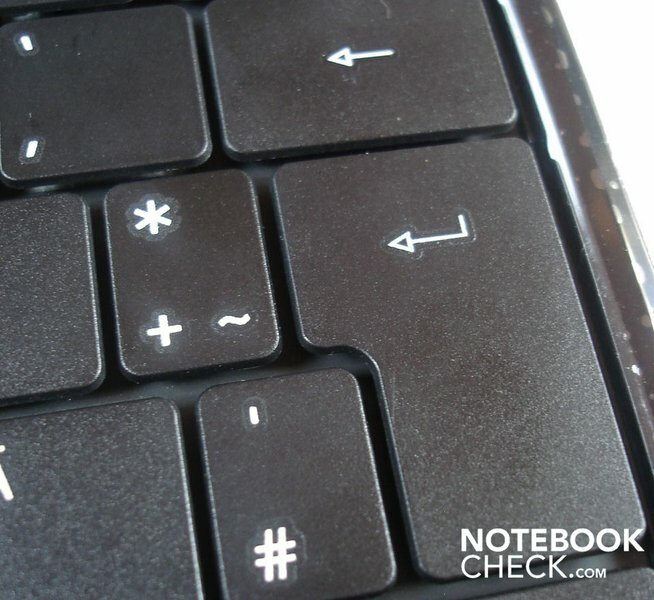 Most keys have a comfortable size, but, some are unusual small, e.g., tab, return, and left shift. Furthermore, especially *,+,~, #, and °,^ are painfully narrow. 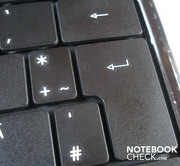 Finally, the cursor keys are that tiny in vertical direction that it is difficult to hit the right one. On the other hand, the layout can hardly be criticized in any way, so, you'll get quickly used to it. 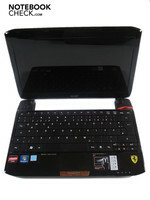 Neither look nor feel of the touchpad distinguishes it clearly from the wrist rests. Its striking silver button alone hint on its location. The size is also not really spacious. On the contrary, you'll need to reposition your finger already after short movements. 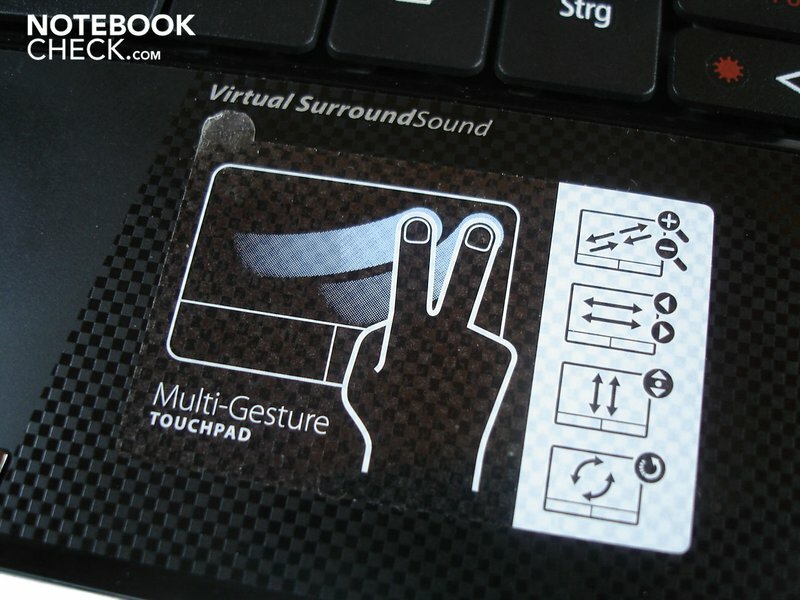 Furthermore, the numerous gestures and the touchpad itself are sometimes unintentionally activated. 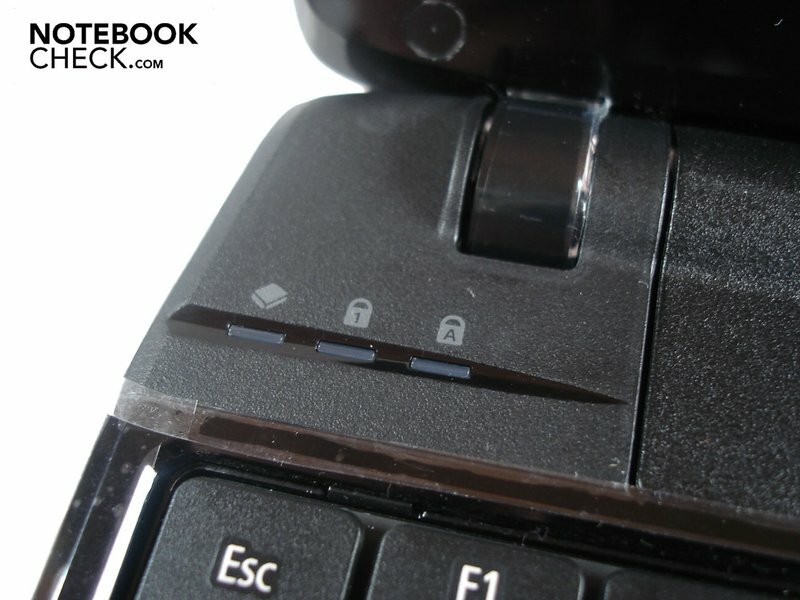 Fortunately it is easy to deactivate the touchpad via a key combination. But, precision and good gliding traits of the sleek surface put our impression into perspective. Finally, also the mouse buttons convince with a clear pressure point and good, acoustical feedback. 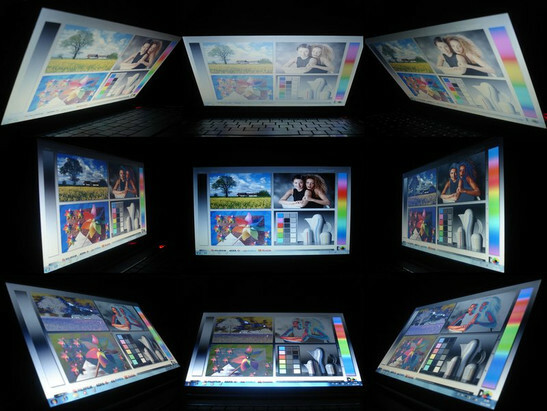 The 11.6 inch display has a LED-backlight and offers a native HD resolution of 1366x768 pixel. The measured data is noticeable. The illumination of 81% is quite good. The maximum brightness of 209.7 cd/m² and the black value of 1.05 cd/m², are alright. But, the contrast ratio of 203:1 could be better. Subjectively we felt that the image is sufficiently bright and its contrast acceptable. As long as the viewing angle is close to ideal, also the black value is alright. The colors appear relatively luscious and natural. To summarize, the display is, compared to other subnotebooks/netbooks, superior. 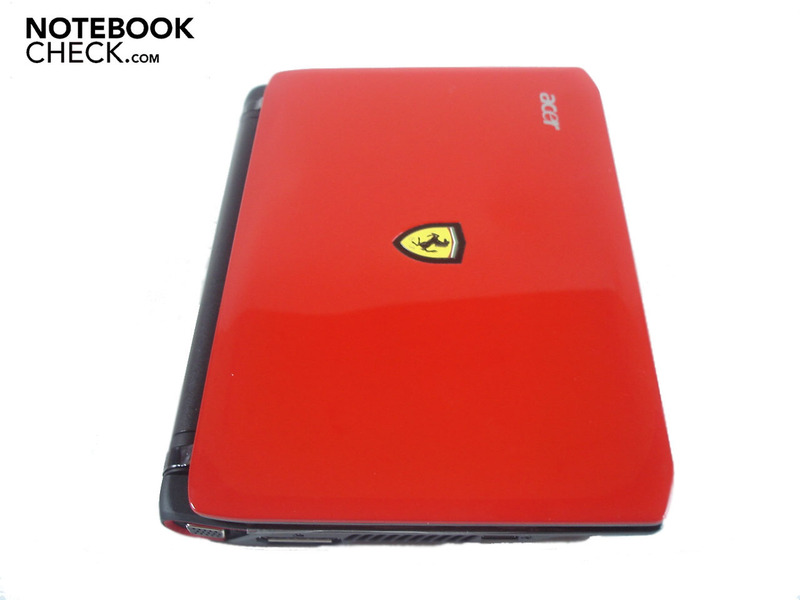 Unfortunately Acer used a glossy surface for the display of the Ferrari One 200. Even indoors unfavorable location of windows or light sources might result in disruptive reflections. Outdoors, in particular in the sun, you won't recognize much. But also in the shade the mirror effects are a limiting factor. That's a shame, because the Ferrari One 200 with its small size and long battery life would otherwise be an excellent mobile companion. Furthermore, the viewing angles of the display are very narrow. In particular in the vertical plane even the smallest deviations lead to clear color and brightness changes. Regardless of our viewing direction one half of the image remained nearly always grayish. So, especially during mobile use, only a frequent adjustment of the opening angle can guarantee an optimal image. 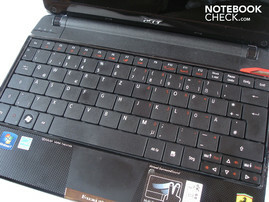 Acer focused on low energy demand and selected the inner components accordingly. 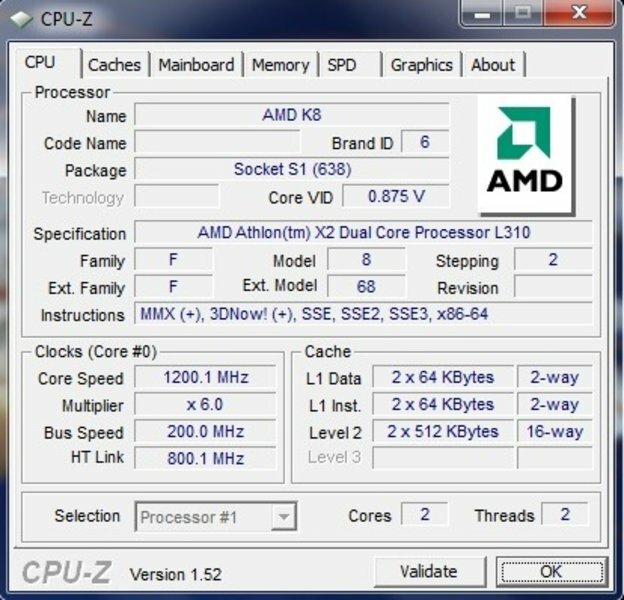 AMD's Athlon 64 X2 L310 is used as CPU. This dual-core CPU runs at a clock rate of 1.20 GHz and owns 1 MB L2-Cache. The L310 is manufactured in the 'old' 65nm lithography. Other energy sparing CPUs, e.g., the Intel Core 2 Duo SU9300 CPU from Intel are processed in 45nm lithography and use a bigger L2-Cache (SU9300: 3MB). Whether the L310 can keep up with comparable CPUs manufactured in modern technology has been checked by application benchmarks and will be covered a little later. 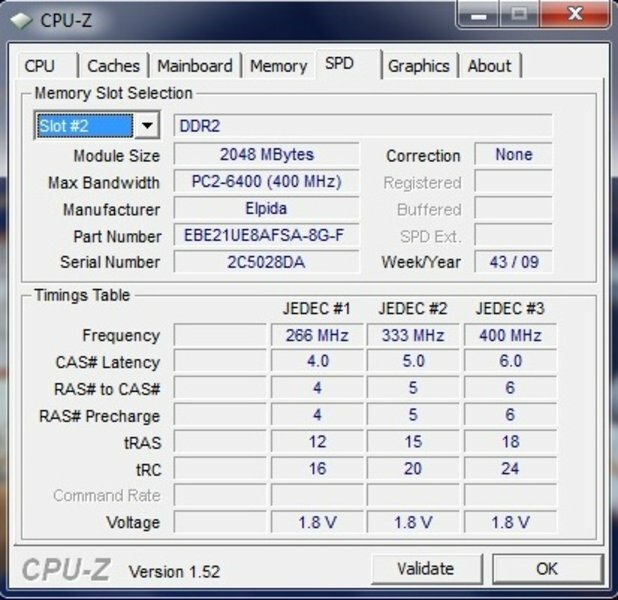 Four GB DDR2 RAM assist the processor, which are efficiently supported by the 64-bit operating system, the pre-installed Windows 7 Home Premium. 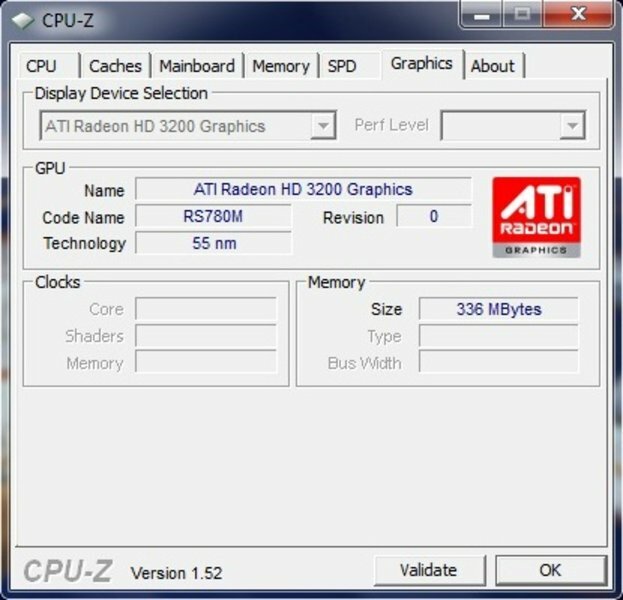 A Radeon HD 3200, an on-board chip from ATI, is responsible for graphics processing. It contains 181 transistors and supports the CPU during processing high-resolution videos by means of a separate video decoder called UVD. The PowerXpress technology allows to dynamically switch between dedicated (if available) and integrated graphic processor. This way, the energy demand is limited. 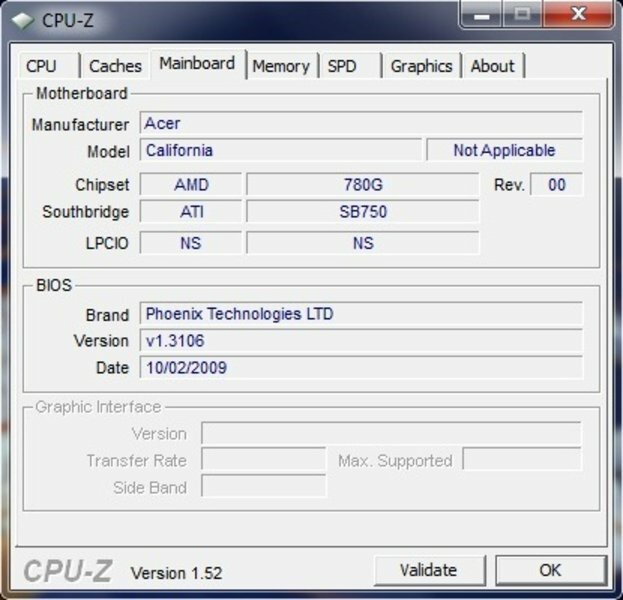 In addition the Radeon HD 3200 also features DirectX 10 and Shader Model 4.0. 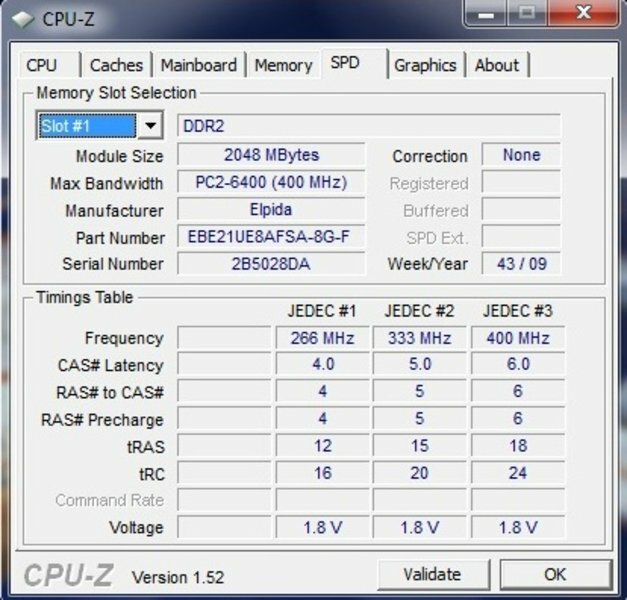 As the Radeon HD 3200 does not have video memory for its own, it uses a part of the available RAM. 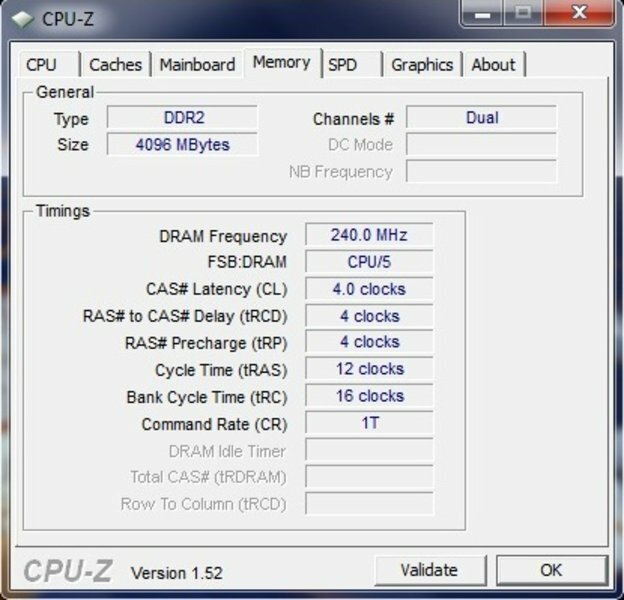 The clock rate can be up to 500 MHz. 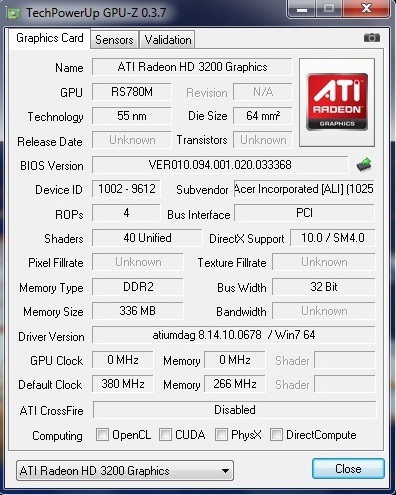 However, Acer only clocks the Radeon HD 3200 with 380MHz (core) and 266 MHz (memory) in the test sample. Let's quickly come back to the XGP-port once again: Compatible external graphic cards were hardly available and rather expensive up to now. E.g., Fujitsu Siemens offers the "Amilo Graphic Booster" with Radeon HD 3870 (512 MByte DDR3-VRAM) for its Amilo Sa 3650. But, we have good news: In all likelihood Acer will launch a Radeon HD4670 with 1024 MB DDR-VRAM at 249 euro soon. In the Cinebench R10 the Athlon 64 X2 L310 performs well compared to other subnotebooks. 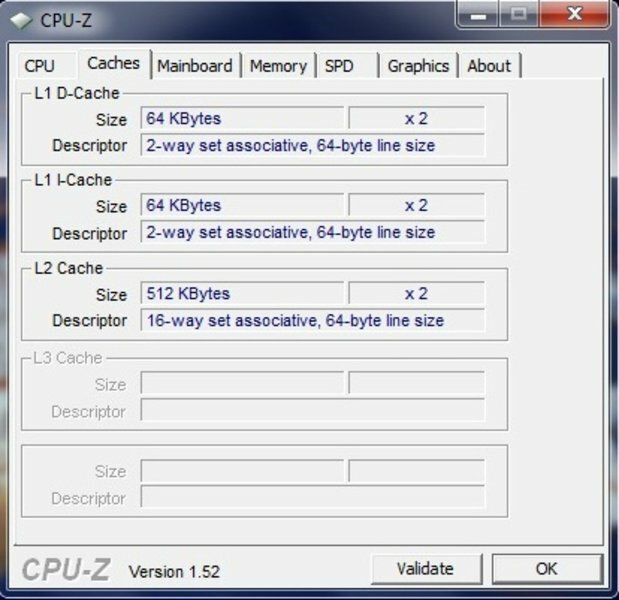 In the single-core rendering it achieved 1113 points and 2132 in the multi-core rendering. 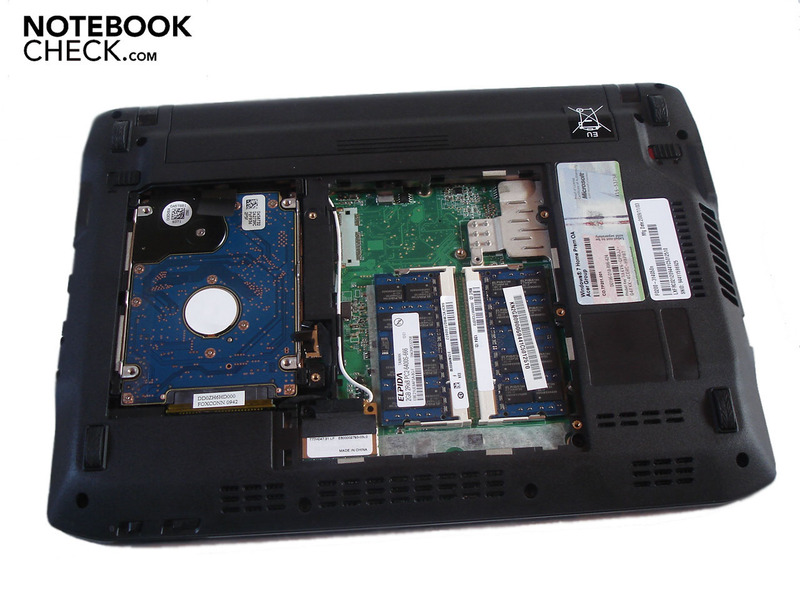 Intel's Atom N280 (single-core, 1.66 GHz, 512 KByte L2-Cache), which is commonly used in netbooks, has to clearly commit defeat with 564 points in single-core and 868 points in multi-core rendering. However, Intel's Core 2 Duo SU 9300 (dual-core, 1.20 GHz, 3 MByte L2-Cache) computes slightly faster than the L310 and accomplishes 1392 points in single-core and 2463 points in multi-core rendering. 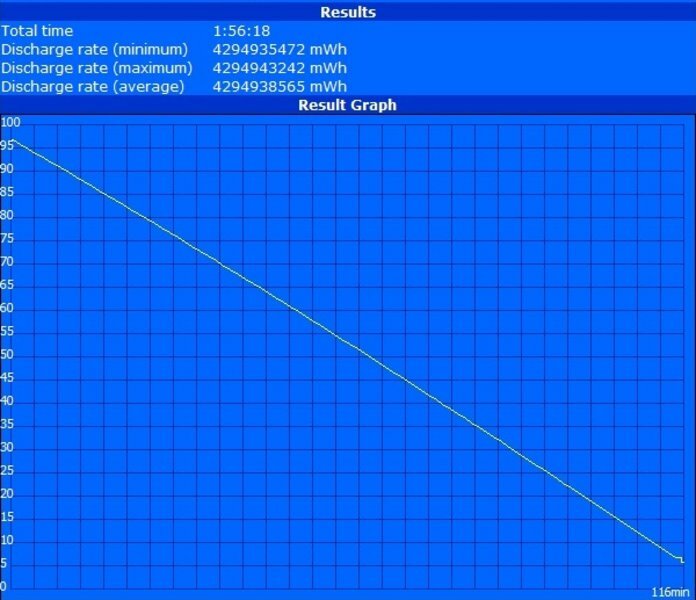 In the PCMark Vantage the Athlon 64 X2 L310 reaches with 2149 Punkte a relatively decent result. But, now to the graphic-oriented benchmarks: In the 3DMark 01 the Radeon HD 3200 achieved 5710 points, in the 3DMark 03 2400 points and, finally, in the 3DMark 05 1771 points. The GMA 950, one of Intel's on-board graphics chips often used in netbooks is with 411 points in the 3DMark05 clearly slower. Intel's GMA 4500M HD, which is commonly used in subnotebooks or office notebooks, is with 1230 points in the 3DMark 05 slightly slower than the Radeon HD 3200. The hard drive is made by Hitachi and offers a gross capacity of 500 GByte.The HDTune tool certifies the hard drive good values. The average transfer rate is 63.5 MB/s and pleases just like the burst rate of 135.2 MB/s. Just the access time of 19.1 ms is somewhat too high. 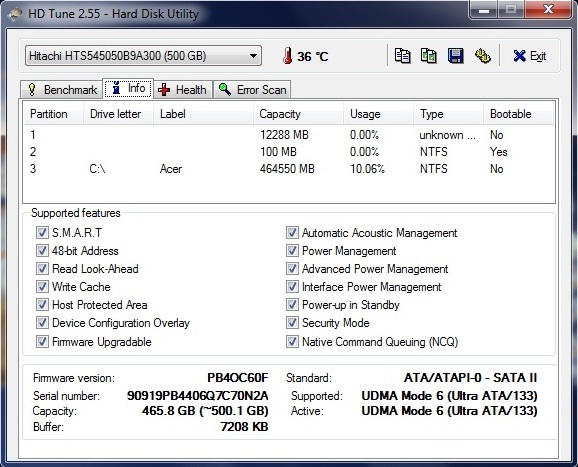 Acer only created a single partition of 453 GB. As in Windows Vista the performance index of Windows 7 does not really allow a significant evaluation of the performance in practice. Nevertheless, we do not want to keep them back from you, because they might be useful for a rough approximation. 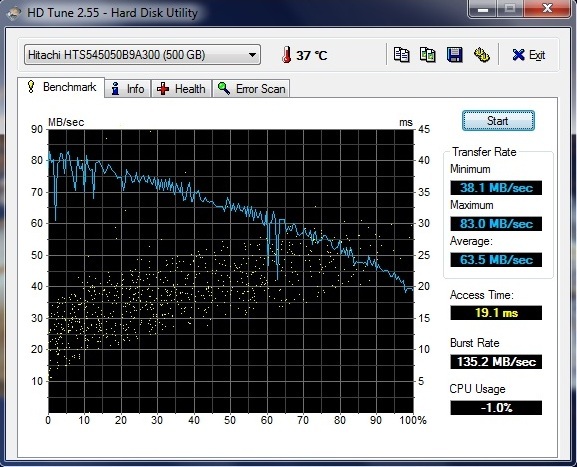 The hard drive scores with 5.9 points best, followed by the RAM with 4.9 points. The CPU with 3.6 points ranks clearly behind. And the desktop performance of the graphics card is with 3.3 points the bottom of the league. 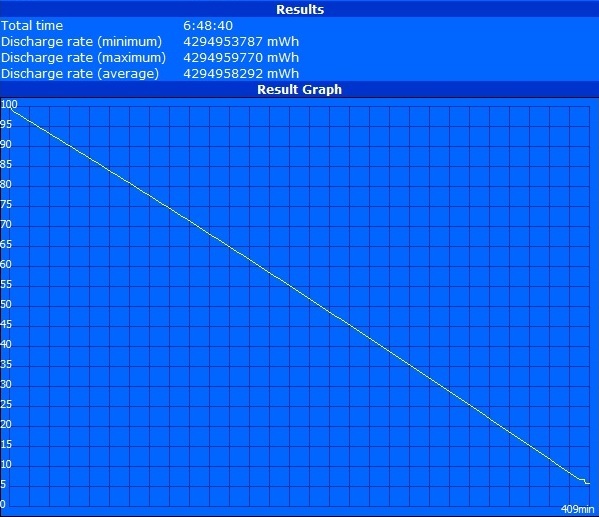 However, in 3D-business and gaming performance it scores with 4.8 points much better. 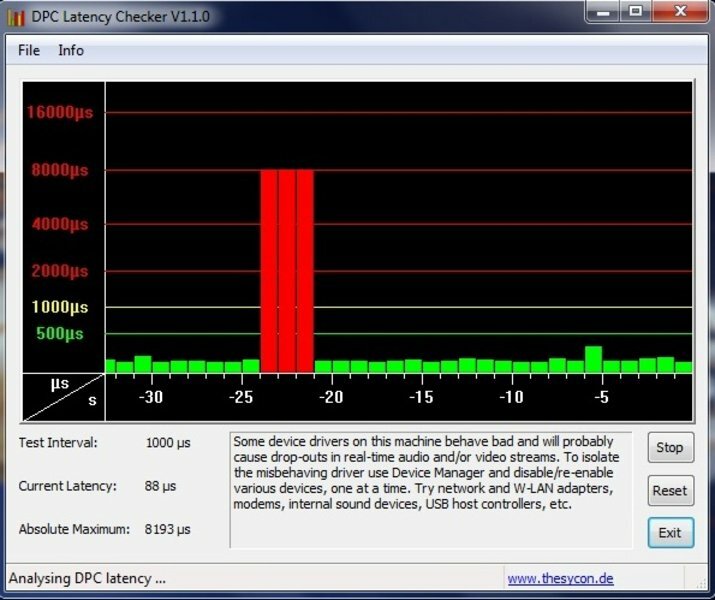 Those who are interested in connecting external devices to the notebook, should watch out for the latencies before buying, because too high latencies might lead to nasty surprises, i.e., transmission errors, e.g., sound crackling. Although the latencies stayed most of the time in the green below 500µs, they sometimes rocketed up to much too high 8000µs. A selective deactivation of device drivers (e.g. via the Device Manager) might help to find the problem. Verdict: The applications performance of the Ferrari One 200 is by no means outstanding, but it easily suffices the daily routine. The Athlon 64 X2 L310 is about on par with its counterpart from Intel. The on-board Radeon HD 3200 graphics chip even performs better than its competitor from Intel (GMA 4500M HD) in the application benchmarks. We will examine whether the ranking is different in games below. As the Radeon HD 3200 is a on-board graphics card and not really designed for gaming, we reduced the detail level in games to the minimum right from the beginning. Left 4 Dead did not run smoothly with these settings and a resolution of 640x480 and achieved only 26.7 fps in average. Intel's GMA 4500MHD computes with 32.4 fps noticeably faster and the GMA 950 is with just 2 fps completely overburdened. In the shooter F.E.A.R. 2 at a resolution of 640 x 480 pixel the HD3200 accomplishes 26.5 fps in average, and unplayable 22.2 fps at a resolution of 800x600. Again, the GMA 4500MHD from Intel is with 25 fps slightly faster. The HD3200 has to struggle with Anno 1404 and heavily studdered at at resolution of 1024x768 with 22.3 fps. Surprise: Intel's GMA 4500MHD achieves only 7 fps at the same settings and proves to be very slow. Finally, we ran Half Life 2 (Lost Coast Demo). At a resolution of 640x480 we could enjoy the game, whereas we recorded 38.40 fps. It was even playable at high details and 1024x768 pixel (33.38 fps). The GMA 4500M HD is at high details with about 26 fps inferior. the GMA 950 is with only 2 fps the bottom of the league. 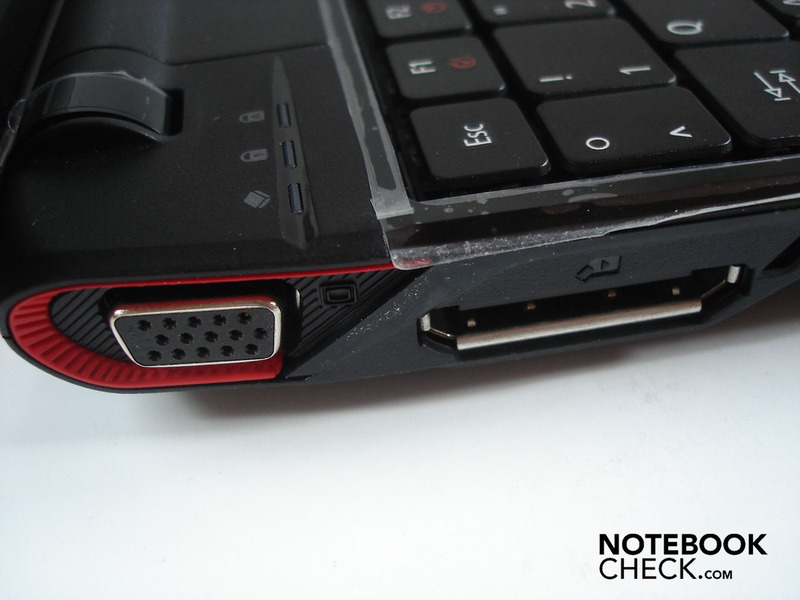 The Radeon HD 3200 clearly outperforms graphic solutions in netbooks (e.g., the GMA 950). Compared to the wide-spread GMA 4500M HD, the Radeon HD 3200 turns out to be a fighter and is sometimes faster and sometimes slower. In older games (-> our article "computer games on laptop graphics cards"), the HD 3200 can sometimes clearly leave the GMA 4500M HD behind. 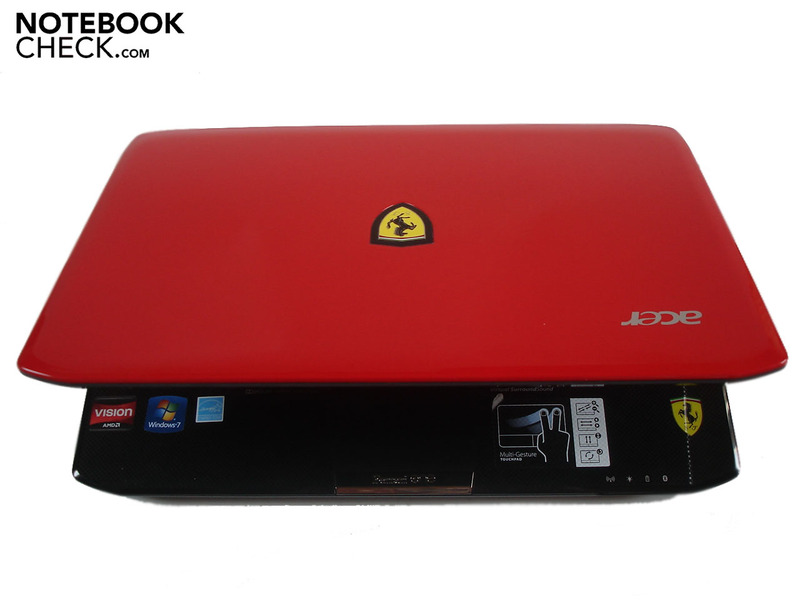 The Ferrari One 200 proves to be a subnotebook which is even capable of smoothly running not too demanding games and older classics at higher detail level. The performance is partly sufficient for playing demanding computer games at low resolution and minimum details. Verdict: You should not expect too much in terms of performance, but the one or other (old) game should be possible. In idle mode the Ferrari One 200 is with 34.4 dB(A) just audible. The noise of the hard drive of 34.6 dB(A) is hardly louder. However, under load the noise raises and ranges from 36.8 dB(A) up to clearly audible, but not yet disturbing 40.8 dB(A). The similarly designed Aspire 1810TZ works about 4 dB(A) quieter. Although this does not sound much, there is a noticeable difference in practice. As usual we measured at a distance of 15 cm. 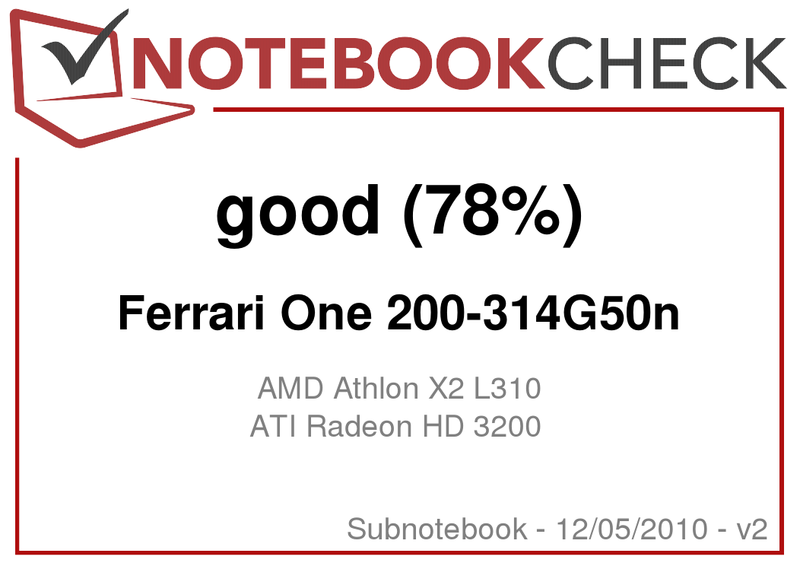 Considering the Ferrari One 200 is a subnotebook it grows quite warm. 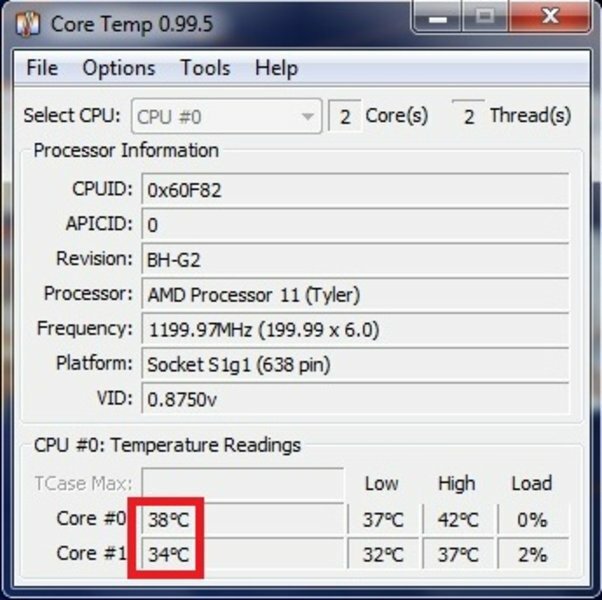 While its bottom side, e.g., reaches up to 35.9 degrees Celsius in idle mode (after two hours, max. energy saving settings), the temperature increases to very high 47.2 degrees Celsius under full load (one hour Prime and Furmark). The upper side stays with a maximum of 32.2°C comfortably cool in idle mode, but under full load the temperature raises to troublesome 39.3°C. 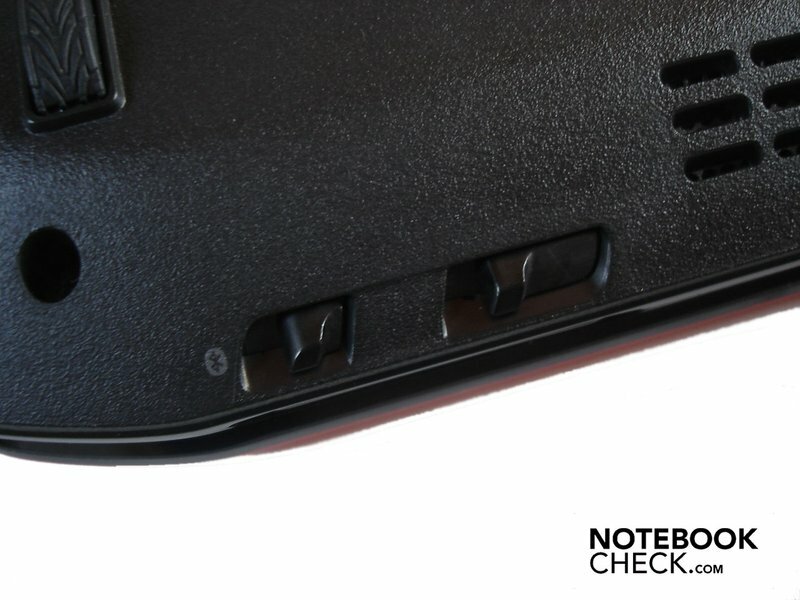 As most users will rarely use this notebook at capacity, such high temperatures should be the exception in practice. Let's compare it to the Aspire 1810TZ again: Under load it reaches with 48.0°C about the same level, but, the wrist rests stay with a maximum of 31.1°C clearly cooler. Regarding inner components, we could only record temperatures for the CPU. 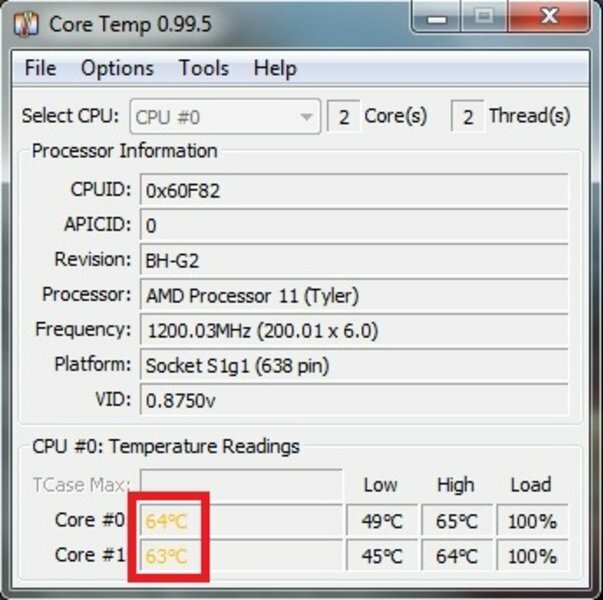 About 36°C in idle mode and up to 64°C under high load are alright. Not much to our surprise the sound scape stays always poor. The basses are hardly audible, hollow and unclear. In addition, the high tones seem fuzzy at too high volume and sound slightly tinny. In general the sound is rather imprecise, modestly balanced, and too thin. Despite Dolby Home Theater and Virtual Surround Sound support we could not fell a surround sound with different sound sources. 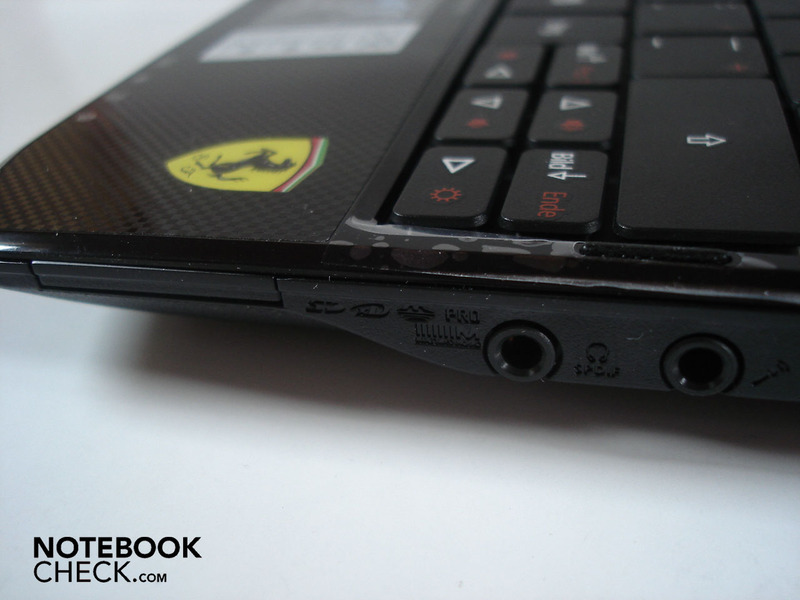 The sound is still not absolutely bad or worse than of other notebooks. However, using external speakers is recommendable if you want to enjoy music. 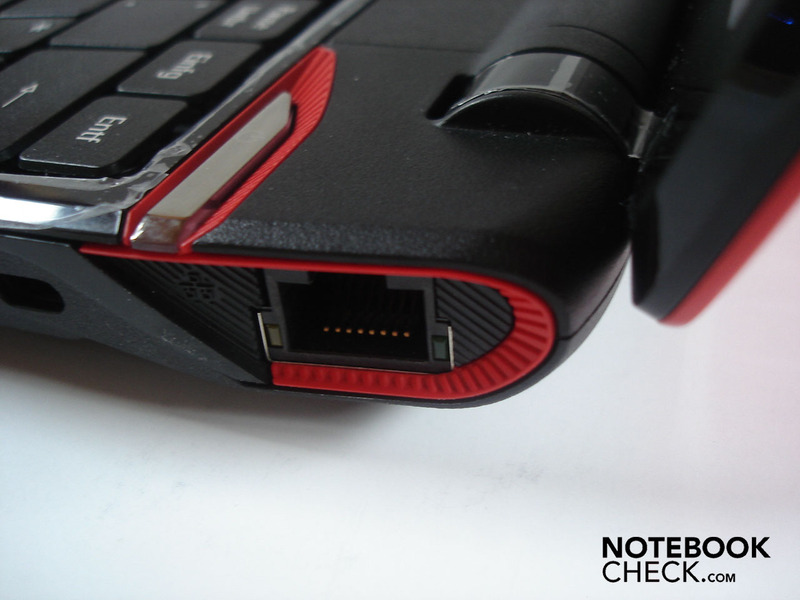 The battery life is decent, but can be no means keep up with the Aspire 1810TZ. In the Reader's test of the Battery Eater the Ferrari One 200 keeps running for very good 6 hours and 49 minutes at maximum energy settings. However, this is only about half the battery life of the 1810TZ, which achieved a vast 12 hours and 31 minutes. During DVD-playback at maximum brightness and balanced energy the battery life falls to 3 hours and 20 minutes. Here the difference to the 5 hours and 56 minutes of the Aspire 1810TZ is smaller. Under full load (Classic test of the Battery Eater) the situation does not improve for the Ferrari One 200. It can run unplugged for 1 hour and 56 minutes while the Aspire 1810TZ can do for 3 hours and 29 minutes. To summarize the 6-cell battery (63Wh) arranges for a good battery life. Nevertheless, compared to top endurance runner of the same manufacturer it seem short. In idle mode the energy demand ranges from 12.4 to 14.7 watt. Under load it increases up to moderate 35.3 watt. Turned off the Ferrari One 200 still needs 0.1 watt, in standby mode 0.4 Watt. The light and small case scores with a harmonious look and excellent workmanship. However, stability or smudge resistance do not belong to the advantages of the Ferrari One 200. Despite some very small keys, the keyboard could convince by its good pressure point. The touchpad is also rather small and so are the short wrist rest areas. Furthermore, the supported gestures are sometimes unintentionally triggered. The display offers a good image quality, but, its reflecting surface makes an outdoor use difficult. The connectivity is not really generous. 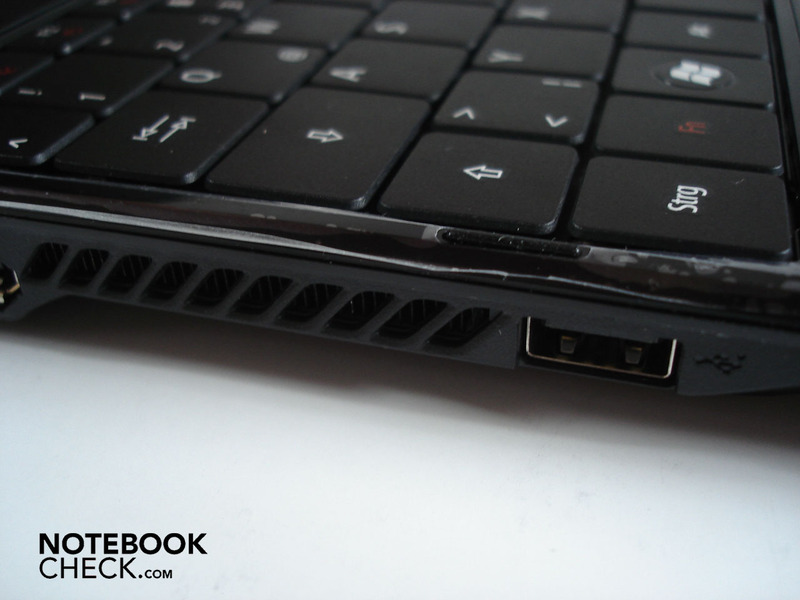 Apart from HDMI or display-port Acer equipped this laptop with the most necessary ports. The application performance proves to be relatively good, but in games the limits are quickly reached. The XGP-port allows to connect external graphic cards. Another pro is the comparably high battery life. But, we did not like the rather high temperature and noise emissions under load. A further con is the mediocre sound. So, external speakers are recommended. Whoever focuses on performance, is a fan of Ferrari, or simply likes red designs, could select the Ferrari One 200. However, if you prefer low temperature and noise emissions and a battery life as high as possible, you should consider its big brother, the Aspire 1810TZ instead. The battery can be inserted at the back in a comfortable way. Open bottom side: hard drive and RAM are accessible. 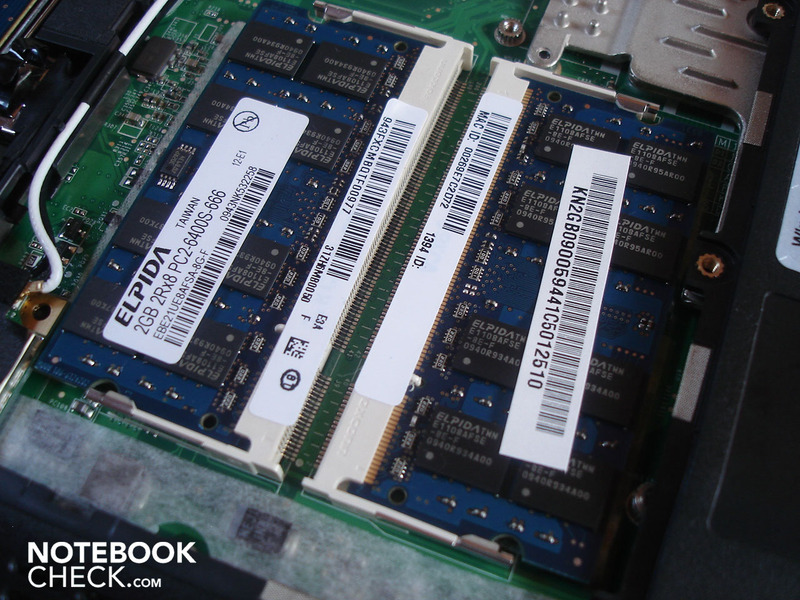 Both RAM slots are occupied by a 2048 MByte DDR2-RAM each. The hard drive from Hitachi offers 500 GB capacity. The Ferrari-Logo can even be found on the wrist rests. Without battery there is a big gap at the back side. The feet are designed wheel-pattern-like. 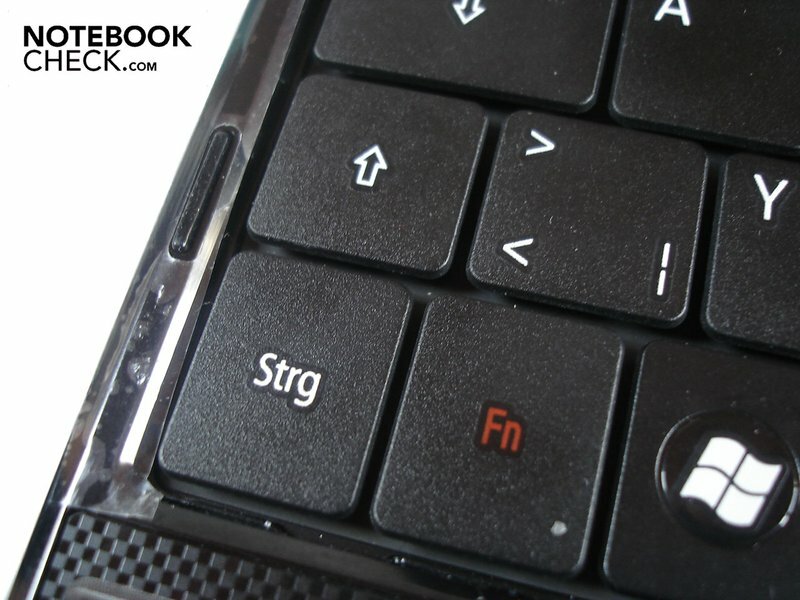 Of course the Fn-key and the related functions are also red. Some keys are rather narrow. 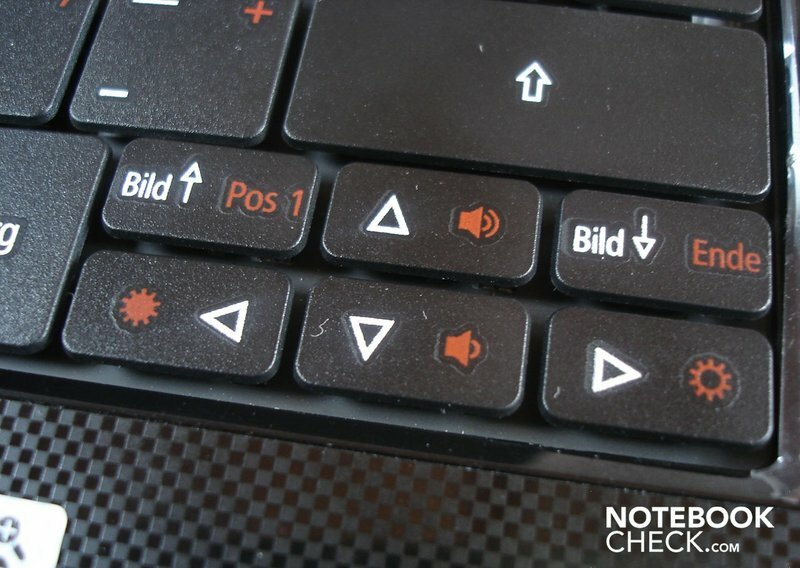 In particular the cursor keys are much too small. 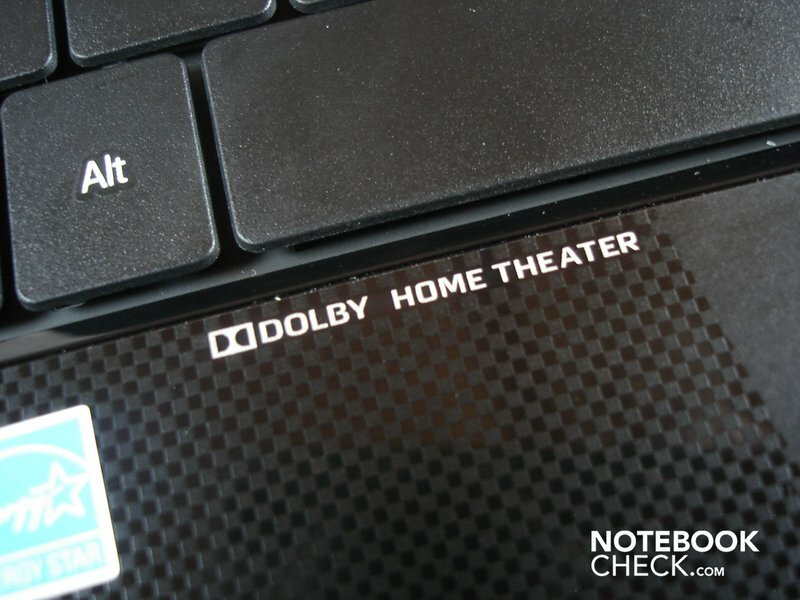 The subnotebook supports Dolby Home Theater. 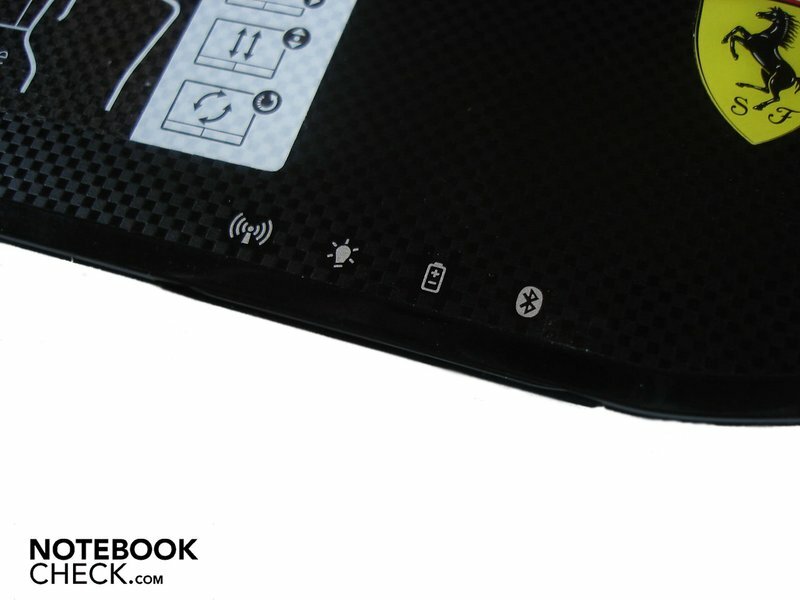 The touchpad supports some gestures. 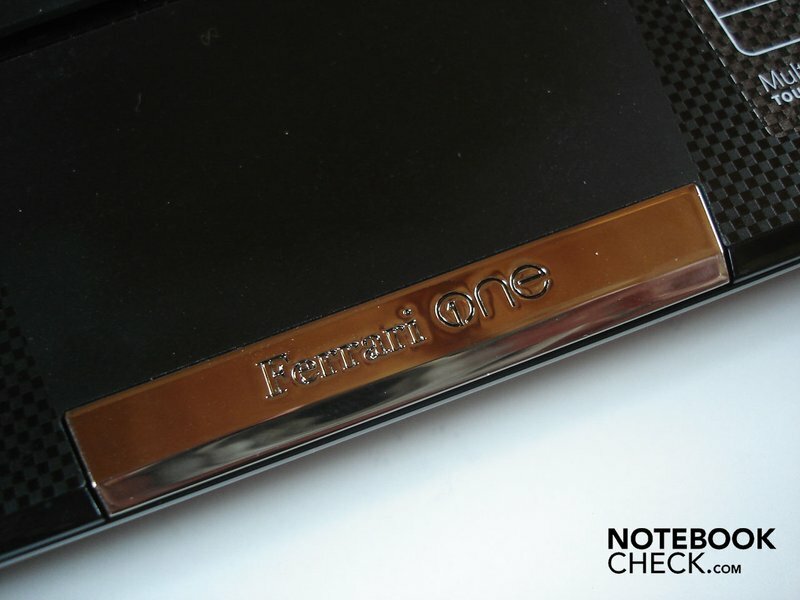 The power adapter of the Ferrari One 200 is conveniently small. A matte display would improve the outdoor capabilities of the Ferrari One 200. 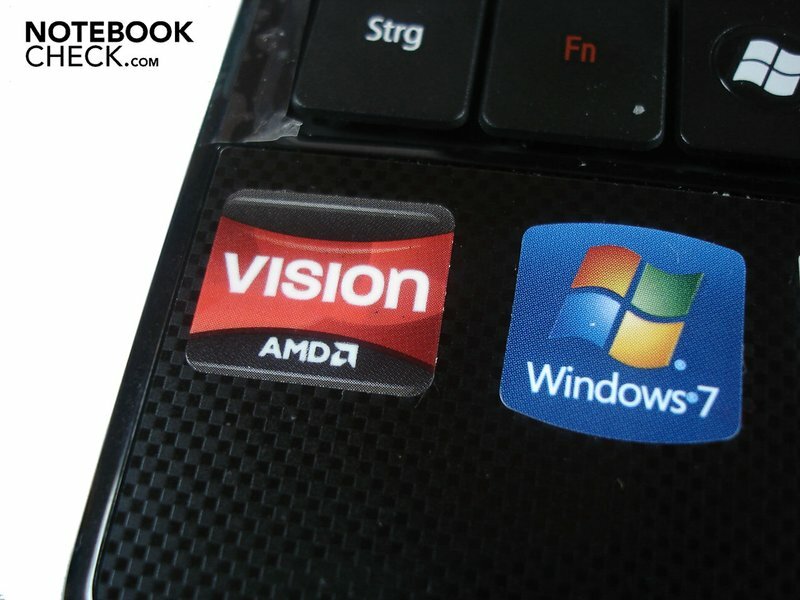 Regarding performance the Radeon HD 3200 outperforms the Intel GMA 4500M HD and the Intel GMA 950. 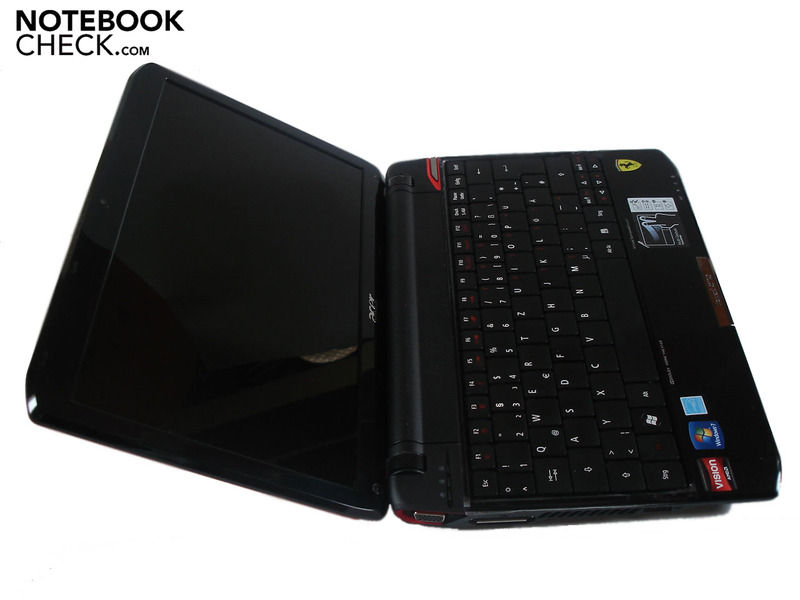 Other subnotebooks, e.g., the Acer Aspire Timeline 1810TZ, the Acer Aspire 3810T/4810T, the X420, the Asus UL30A, the Dell Inspiron 11z, the HP Probook 5310M or the Packard Bell EasyNote Butterfly s. Small office notebooks, e.g., the Acer Travelmate 8371/8471 Timeline. 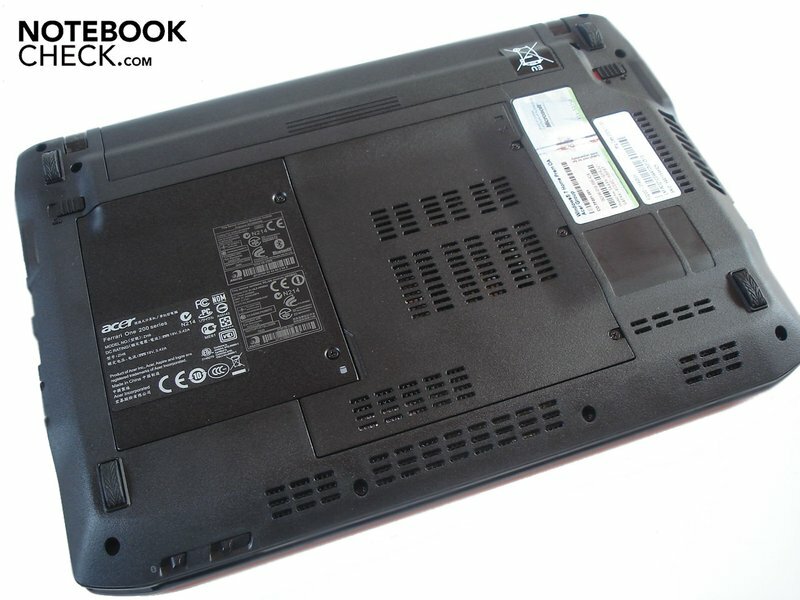 Netbooks, e.g., the Asus EEE-PC 1005HA-M/1008HA, the Samsung N120, the Toshiba NB200, the Sony Vaio-W11 or the Dell Latitude 2100.